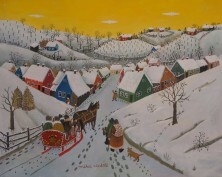 Mihai Vintila was born 1932 in Caran-Sebes, Romania. A veterinarian, he is a self-taught artist who began his artistic career in 1979. 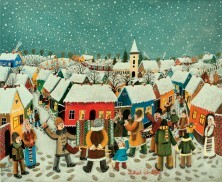 In 1989 Vintila established “ARPLANA” (ARt PLastic NAive / naive plastic arts) – an organization dedicated to further the development of naive art in Romania. He has headed this organization for the past twenty years and, through it, conducts summer “camps” for the naive artists, where they spend a week or two painting, sharing experiences, exchanging artworks and assisting one another. He also uses this organization to issue newsletters, write an occasional book or pamphlet and to assist needy naive artists.